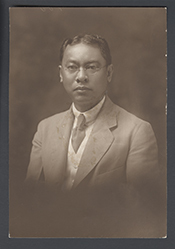 de VEYRA, Jaime C., a Resident Commissioner from the Commonwealth of the Philippine Islands; born in Tanauan, Leyte Province, Leyte, Philippine Islands, November 4, 1873; attended public and private schools in Leyte Province; B.A. Colegio de San Juan de Letran, Manila, P.I., 1893; attended University of Santo Tomas, Manila, P.I., 1895-1897; secretary to the military governor of Leyte Province, 1898-1899; journalist; newspaper editor; member of the Cebu City, P.I. municipal council, 1901; Governor of Leyte Province, P.I., 1906-1907; member of the Philippine assembly, 1907-1912; member of the Philippine commission 1913-1917, executive secretary, 1916-1917; elected as a Nacionalista to the Sixty-fifth Congress for a three-year term and reelected to a succeeding term (January 10, 1917-March 3, 1923); was not a candidate for renomination in 1922; faculty, University of the Philippines, Manila, P.I., 1925-1936; director, Institute of National Language, Manila, P.I., 1936-1944; assistant director, National Library of the Philippines, Manila, P.I. ; staff, Office of the President of the Philippines, 1946; died on March 7, 1963, in Manila, P.I. ; interment at La Loma Cemetery, Manila, P.I.